OCCASIONALLY strength can be a weakness. For instance, sometimes we see too well and actually need something to simplify the amazing visual acuity mother nature has equipped us with. Conversely, if we keep our minds open our weaknesses can become strengths. I got my first reading glasses when I was 48 years old. Initially, I felt the glasses hurt my painting. That was probably true during the period when I was adjusting to the idiosyncrasies of having two glass lenses balanced on my nose. Obviously, I got my glasses because I needed them. My eyes had lost their ability to accommodate various focal lengths. But eventually I began to view my glasses as a positive contributor to my ability to see the big picture. When I'm painting I wear a +1.25 pair of reading glasses to view both the canvas and my palette. When I step back from my painting to view it from a distance I occasionally leave my glasses on and view the canvas as a blur. To further enhance this effect I sometimes use my reading glasses which have +1.50 lenses which further blur the painting. Sometimes I will put both glasses on at once to see the maximum blur and maximum simplification of pattern. In addition to seeing compositional errors you can also easily see errors in value using this method. Leonardo da Vinci used to stare at the blotches and stains on walls and see people, beasts, and landscapes. He called this imaginative exercise quickening the spirit of invention. I do a variation of this by quickly painting in the foliage of a tree, for example, and stepping back to see if the random strokes suggest branches or interior negative spaces. The mind superimposes a perceived order onto chaos and broad visual suggestions become apparent. As you get closer the eye begins to see only the detail and chaos of brush strokes. So I step back, try to fix the imagined image in my mind, then step forward to emphasize the reimagined order. 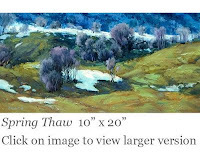 If I look through a reduction lens as I get closer to the painting it is easier to see the overall pattern of the image as imagined from a distance. Although the reduction lens doesn't eliminate the need to step back twenty paces or so, it can speed the painting process. Many artists use a mirror to view their paintings in reverse. I prefer to use a small handheld prism. A prism has the advantage that when you look through it you can rotate it and look at the painting in reverse as well as upside down. Some artists bend down and look through their legs but I find my method more convenient. I sometimes use my reading glasses, my reduction lens, and my prism all at once, or in various combinations. As painters we have to see things differently. Using a variety of optical tools is one way to accomplish that goal.